Like the first book 'Imago' this one is also free of angst and drama. 'Imagines' is the sequel and the final chapter in this wonderfully sweet love story. Lawson has been asked to travel to the far northern part of Queensland to help figure out why the Ulysses butterfly is dying. It's decided that he and Jack will make this their first vacation together. It's a working vacation for Lawson but not for Jack. A bit of a relationship test and happily these two passed with flying colors. I love how supportive Jack is of Lawson's career and needless to say I'm really, really glad that Jack was with him. Lawson and Jack are a sweet and loving couple. They're supportive of each other and throughout both of these stories I never felt like that was something that either of them took for granted. I love my stories with their angst and drama and over the top things but sometimes it's just really nice to find a story like this where the relationship is really solid. That Jack appreciated and respected Lawson for his intellect and dedication to his career was for me reciprocated by the fact that Lawson showed him the same appreciation and respect and never acted like Jack was less because he didn't have Lawson's IQ or credentials. This was for me a well balanced relationship and the fact that these two men were totally hot for each other...well that worked too. While Jack and Lawson did have a bit of an adventure on this one, which was good because otherwise...boring. I enjoyed that their adventure didn't include any unnecessary relationship drama. The extra bonus in this story for me was the butterflies. I love it when a story prompts me to learn more about something and I admit I've spent most of my morning googling about butterflies specifically ones native to Tasmania and Australia...I might have peeked at Cane Toads too but that didn't last long I learned all I need to know in a matter of seconds...they're freakin' ugly...poisonous and ugly what a wonderful combo. 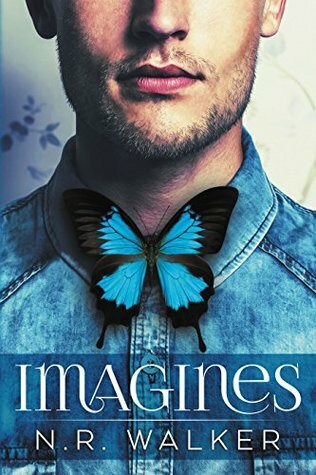 "Jack, there are species of Lepidoptera all over this world, but there are none - none - like those I experience when I'm with you..."
An ARC of 'Imagine' was graciously provided by the author in exchange for an honest review.